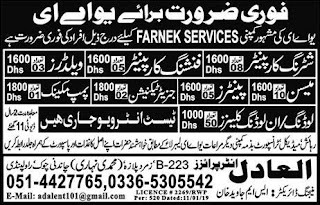 Below are the complete details of the Welder jobs in Al Adil Enterprises in Rawalpindi. Skills Required for Job: Candidates must have Good Communication Skills. Good Team Working Skills. Strong ability to read and interpret engineering drawings and blueprints. Extensive knowledge of various welding techniques, including TIG welding, oxy-fuel welding, and arc welding. Excellent oral and written communication skills. Skilled in both mechanical and manual welding practices. Qualification: Al Adil Enterprises Rawalpindi Jobs For Welder must be literate with minimum experience in relevant field its a contract based jobs, only male can apply for this post the late date of submission application is continue. 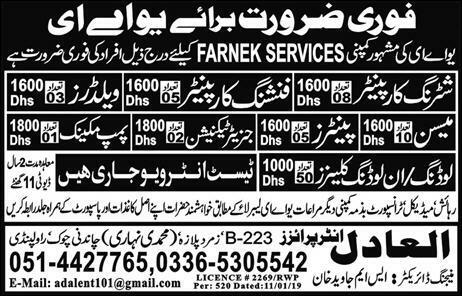 Welder jobs in Al Adil Enterprises Rawalpindi, in Pakistan published on Paperpk.com from newspaper on January 12,2019. Job seekers who are already working as Argon Welder , Welder , Tig Welder , Tech Welder can also apply for post of Welder.